Undeterred by the recent lawsuit by Apple, Samsung has come to IFA 2012 in full force. It was inevitable that the Korean manufacturer would launch Windows 8 and Windows Phone 8 devices, but this time around, the devices run on the latest generation hardware. 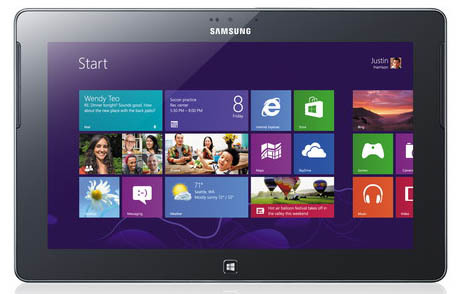 Introducing the Ativ S and Ativ Tab, Samsung’s brand new range of Windows based devices. Unlike the Windows Phone 7.5 devices that ran on lower hardware than it’s flagship models, the Samsung Ativ S has pretty much the same specs as a US Samsung Galaxy S3. Also, the Samsung Ativ Tab will come with a Qualcomm Snapdragon S4. Here’s our Samsung Ativ S and Ativ Tab first look! 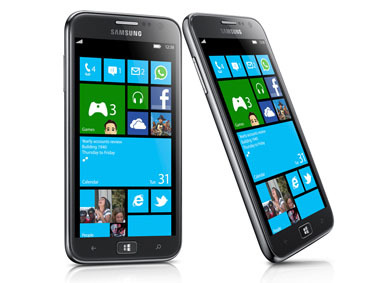 The Samsung Ativ S is the first officially revealed Windows Phone 8 device. It comes with a host of new features that Windows Phone 8 now supports, including expandable memory, a dual-core processor, NFC and more! Not to mention, the aluminum casing looks fantastic even though the phone shape itself isn’t too enticing. It sure looks like it can take a drop or two, not that we recommend it though. Finally, Windows Phone 8 devices also get HD screens and the Ativ S comes with a gorgeous 4.8 inch screen. Backing up all this hardware is a large 2300 mAh battery. The Samsung Ativ Tab is a 10.1 inch screen tablet running Windows 8 RT that will go head to head with Microsoft’s own Surface. It runs on the same dual core Snapdragon S4 but will come with 2 GB RAM and a huge 8200 mAh battery to keep things zippy. Furthermore, it will come in 32 and 64 GB variants with expandable memory support. Since Windows 8 RT will come with Office 2013 RT out of the box, it’s going to need all that storage space. The screen is a capacitive LCD multi-touchscreen running at 1366 x 768 resolution and is said to be very vivid and bright. Samsung brings the brushed aluminum finish to the Ativ Tab too. Looks like Samsung is finally adopting Windows 8 and Windows Phone 8 in a big way, the Ativ range looks promising. Do let us know what you think of the Samsung Ativ S and Ativ Tab first look! I guess Sammys Rushing things out after they lost out to Apple. But still I think Windows 8 is the Way to go! . Go Sammy! We’ve been seeing rumors of the Samsung Ativ S since quite a while. It was pegged as “Samsung Odyssey”. But yeah, Windows Phone 8 is looking good!